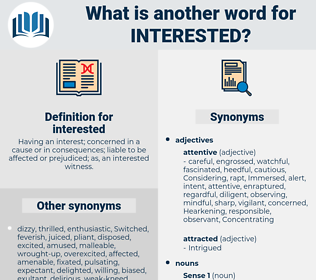 What is another word for interested? Having an interest; concerned in a cause or in consequences; liable to be affected or prejudiced; as, an interested witness. keen, desirous, willing, eager, self-serving, interestedin, anxious, desire, enthusiastic, intent, inclined, committed, curious, wish, sensitive, respective, inquisitive, motivated, attentive, informed, attractive, intended, exciting, involved, Intending, ready, receptive, worried, aspiring, appropriate, prepared, useful. jurisdictions, proponents, trainees, protagonists, recruits, applicants, contributors, defendants, individuals, claimants, complainants, addressees, nominees, guests, Persons, takers, appellants, players, Proxies, actors. Investigated, wishing, Wished, Examined, Explored, raised, considered, addressed, studied, Attracted, accessed, engaged, Referred, Dealt, Looked, thought, concerned, involved. Intrigued, Investigated, Instituted, entitlements, sensitized, invited, positioned, Organizations, destined, Wished, designated, monitored, liked, Disappeared, Examined, Served, reviewed, Urged, seized, Aimed, advised, reported, preoccupied, Explored, arranged, loved, directed, HIT, proposed, raised, Cared, Accommodated, considered, addressed, sought, welcomed, traced, Attracted, i.e., focussed, Followed, Been, located, Provided, received, Worked, defined, Caused, implicated, given, accused, Watched, Discussed, paid, Told, engaged, become, Asked, hope, Hoped, Shown, linked, drawn, Tempted, doomed, taken, placed, Believed, Dealt, stated, said, felt, Looked, thought, done, Meant, concerned, interestedin, inclined, committed, curious, motivated, intended, involved, worried, prepared. concerns, matters, pertains, examines, involves, explores, targets, cares, Studies, relates, Focuses, Affects, engages, covers, counts, cuts. ignorant, impartial, unenthusiastic, inattentive, bored, unmoved, incurious, ok, unbiased, uncaring, fair, indifferent, disinterested, unconcerned, apathetic. dulled, uninvolved, blase, dismissive, benumbed. I know you aren't much interested in my kind of things, Cousin Mary. I'm not as interested in things as I was.